View of the art market—what will tomorrow bring? Shall we pick this one . . .
... or that one up there? 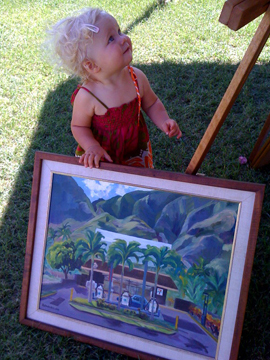 No one bought much art today at the Native Hawaiian Arts Market, but there were plenty of art appreciators. I am happy to show my work and talk about it with others. I met some very nice people, and some friends stopped by. 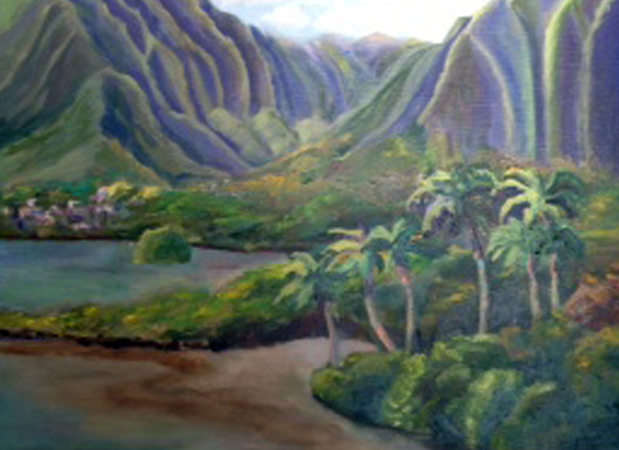 Miss Marvelous liked “Gas Pumps in Paradise,” an earlier work painted in 1993 of the 7-Eleven and gas station in Kaaawa the day Bula Logan led a sovereignty march along Kamehameha Highway. 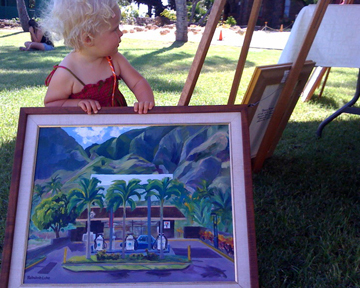 The painting was part of my “Painting the Town” collection of all the public structures in Kaaawa: the post office, the fire station, the school, the bath house, the library (bookmobile), and two bridges. I remember organizing with Pat, the then director of Swanzy Beach Park, an art show reception to open the new covered lanai for the park facility. I showed the paintings with environmental portrait photography of the people who worked in the buildings. The only advertising was a hand-painted roadside sign by the summer fun kids that read, “Everybody come.” And everybody did! Times have changed. Rather than keep “Gas Pumps in Paradise” as a leaner becoming shop worn in the studio, I’ve marked it down to $200.00, solid koa frame included. The amount is half the original price. 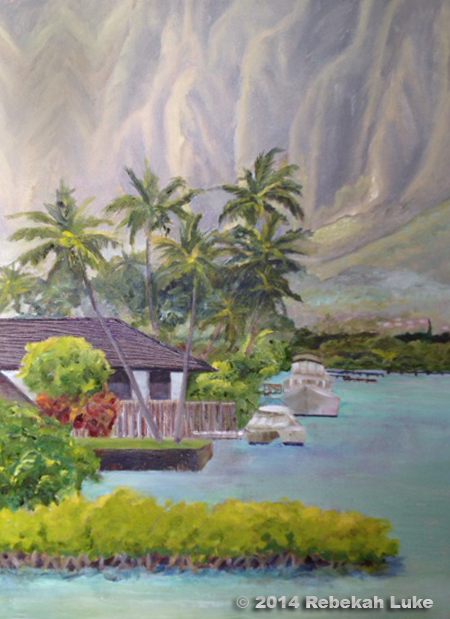 Looking for a venue to show my paintings, I asked for and am granted a spot at a two-day Hawaiian native arts fair—the Native Hawaiian Arts Market & Keiki Art Festival. I can’t say how many artists are showing in this 5th annual MAMo (Maoli Arts Month) event, but anytime there is a gathering of Hawaiians expressing themselves it’s worth noticing, especially if one lives in the Islands. It’s a good thing to keep up with the host culture of where you live. So please save the dates: May 22 and 23, Bishop Museum grounds, entrance on Bernice street between Kalihi street and Kapalama avenue in Honolulu, 9 a.m. to 5 p.m. Special admission (see below). With Native fine art and craftmanship, art that is now and art that is part of our ongoing living history, one can appreciate how the indigenous, or maoli, peoples, are evolving and what we have to say about ourselves, our land, and the universe. The artwork you see will be for sale. 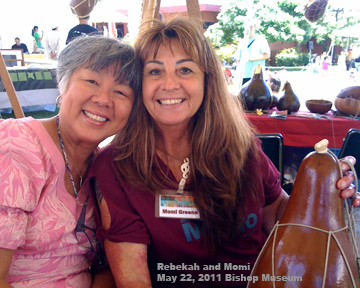 It is a joy to support Native Hawaiian made products in Hawaii. 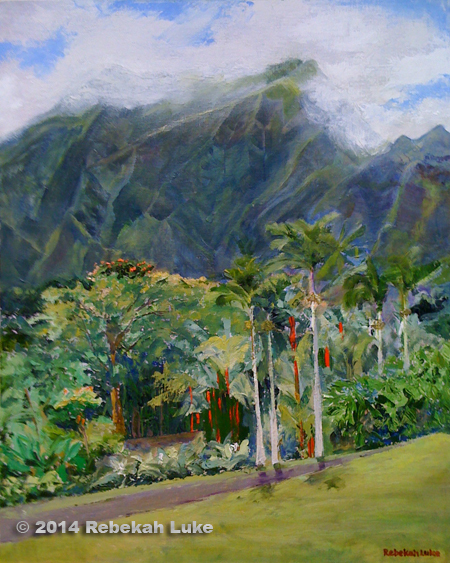 At the Arts Market buyers can know that the Hawaiian artists can keep all the money earned from their original creations, as opposed to giving a commission to a gallery. 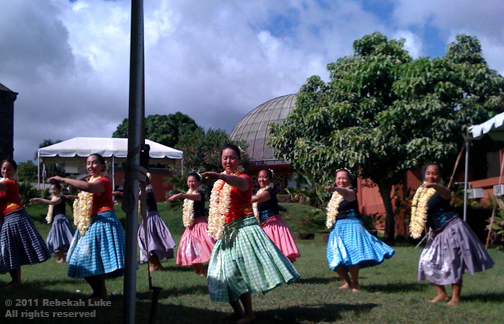 Several sponsors and grant makers, led by the PA‘I Foundation, make this possible. My own paintings, the ones on the PAINTINGS link of this website and several new canvases, are in the studio in different stages toward completion, gearing up for this event. 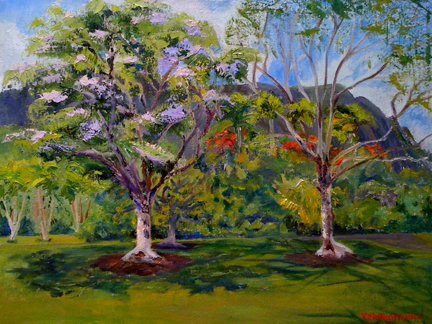 The last time I exhibited actual pieces in a public gallery was in 2007 in a group show with my hapa Chinese cousins at Gallery on the Pali in Nuuanu. 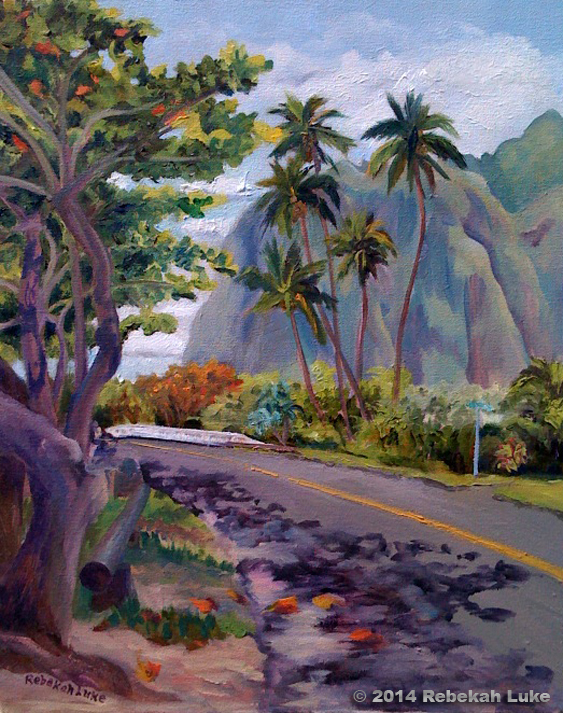 So, I’m very excited to return to the art scene in Honolulu. This week I’ll be signing, varnishing, framing, inventorying, and pricing the work while DH builds a few more display easels. 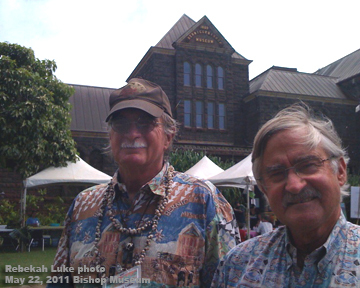 DH is my main easel, and perhaps he will take a break from his Bishop Museum docent gig to join me in greeting you when you come next Saturday and Sunday. You’ll have a fabulous time. 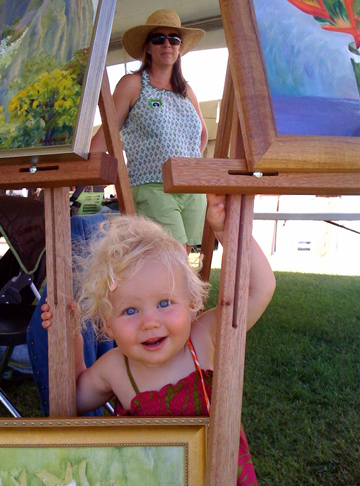 Meet the artists and talk to them about their work. Bring $5 admission. That will get you into the Bishop Museum galleries including the new Hawaiian Hall, as well. Bring a lot more kala (money) to buy some art. Artists have to eat too. 😉 Thank you and all the organizers and supporters of Maoli Arts!